Fly fishing the salt can be a real battleground - big, tough fish - and even bigger, tougher conditions. Often it comes down to a single cast at a shadowy bonefish, a slinking tarpon or a screaming striper. And the last thing you want to worry about is your line failing when you take the shot, so when you go, make sure you're well-armed with RIO Saltwater Fly Lines. Our arsenal of saltwater specific lines feature AgentX® Technology to keep our floating lines high and dry for quick pick-ups while the ultra-slick XS® Technology lets you shoot for incredible distance. And our unique climate-specific saltwater coatings and cores let us design thinner, more aggressive tapers which produce higher line speed and easily penetrate the ever-present elements. We can't promise that you'll keep your cool in the heat of battle, but the confidence that comes with knowing you're well equipped will help you make the shot when that opportunity ghosts by. So, prepare for battle, load up with RIO® Saltwater Fly Lines. Offshore and inshore action abounds south of the border. Cape Lookout offers some of the most exciting albie fishing anywhere. Historic Hilton Head boosts year- roi ind fish ing. Six surefire tactics to catch more bass in the surf. "Bryant: A Great Voice and Much More"
Grand Slam! 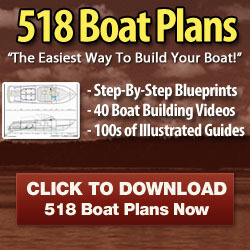 Hell's Bay Acquires Gordon Boatworks: Six to be Inducted Into Hall of Fame . . . and more. Tinkering Around: The Blonde Silvers ide; Use Silicone to Create Weedless Flies. Fishing marshes and the backcountiy; spooling line and backing; better wading . . . and more. On the cover: Pacific black skipjack (or barrolettes) are as thrilling on fly as they are beautiful. Photograph by Capt. Sarah Gardner. 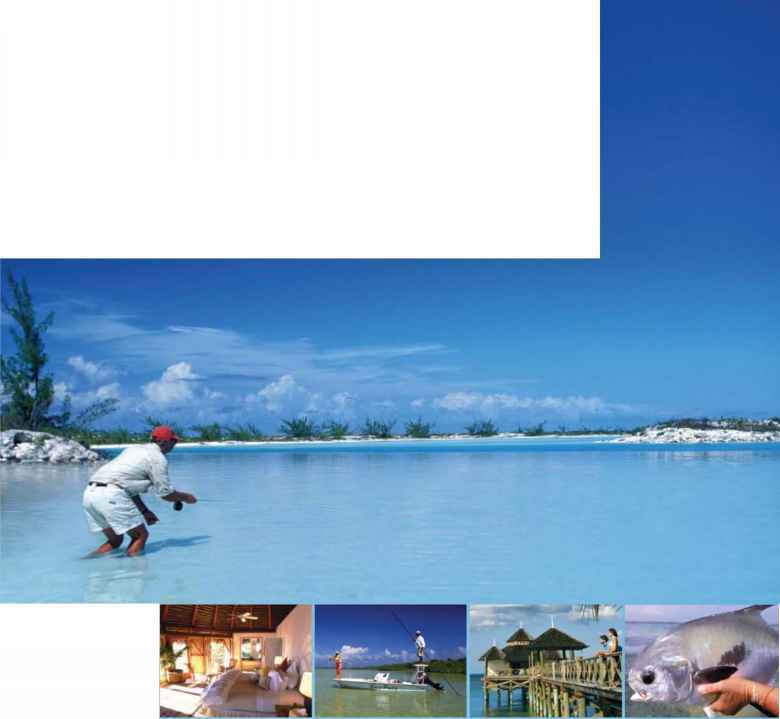 Fly Fishing in Salt Waters (ISSN 1085-5769, USPS 0013-479) is published bimonthly: January/February, March/April, May/June, July/August, September/October and November/ December by Bonnier Corporation, PO Box 8500, 460 N. Orlando Ave., Ste. 200, Winter Park, FL 32789-3195. No part of this periodical may be reproduced without the express written permission of FFSW magazine. Periodicals postage paid at Winter Park, Florida, and at additional mailing offices. Occasionally, we make portions of our subscriber list available to carefully screened companies that offer products and services we think may be of interest to you. If you do not want to receive these offers, please advise us at 1-877-566-5833. POSTMASTER: Send address changes to Fly Fishing in Salt Waters Subscription Services Dept., PO Box 420235, Palm Coast, FL 32142-0235. Subscriptions: In the U.S., $19.97 per year (six issues). Add $6 per year plus GST for delivery to Canada and $12 per year for delivery to other foreign countries. All payments in U.S. funds only. For subscriptions and adjustments, write to Fly Fishing in Salt Waters magazine, PO Box 420235, Palm Coast, FL 32142-0235 or call toll-free 877-566-5833 Disclaimer: Bonnier Corporation is not responsible for injuries sustained by readers while pursuing activities described and illustrated herein, nor failure of equipment depicted and illustrated herein. Printed in the USA. A roundup of gear for salty fly-rodders. The thought of setting 4/0 hooks into galvanised buckets with a flyline that wouldn't act like a bungy cord has always appealed -the reality was even better than we had hoped. Ridges in the coating reduced 'hi speed tangles' -the ridged surface easily sliding over itself as the running line whipped up from the deck. One from the sand is worth 10 from the boat. So writes ("apt. Gene Quigley in this issue's feature, "Stripers in the Suds." Gene is referring, of course, to the old expression echoed for years by serious surf fishermen in the Northeast. It simply means that catching a striper from the surf is more rewarding than catching one by boat. But it's more than that — it's really a philosophy on fishing. It's a philosophy tluu emphasizes quality over quantity. I got to thinking about this concept recently during an engaging chat with David Dalu. If you're not familiar with David's name, he pulled off quite a feat this past summer with Capt. Scott Collins by consecutively winning the three big tarpon tournaments in Islamorada. It had never been done before. No question about it, David is a fierce competitor. I.ike most who fish competitively, he is meticulous in every aspect of his flyfishing and is certainly into the "quantity" game. During our interview, David talked my ear off about ever)' detail of every tarpon in ever)' tournament he and Scott won! But he also recalled another story that I found refreshing. Dalu told me about hooking a monstrous fish that spit the fly right next to the boat during a heated moment in one of the events. The big girl sat there for a moment, stunned in the water, staring up at him with big, black eyes. Then it slowly turned and lumbered away. "1 just sat down and laughed!" Dalu recalled. "I remember thinking to myself that I hope I never become so enthralled in winning that I forget to appreciate what a tremendous fish die tarpon is and how much fun — and what a privilege — it is to fish for them. I hope that always remains the most important thing. Scott and I talk about that all the time." L-to-R: Flip Pallot, Lefty Kreh, Bill Bishop Jr., March/April 2000. While quality may be getting harder and harder to find these days (and not just in our fishing), I'm happy to report that beginning with this issue of Fly Fishing in Salt Waters, you'll be treated to a regular column written by a man who exudes quality. Flip Pallors quiet demeanor and respect for the outdoors had a tremendous influence on me when I was young. He wasn't flashy. He wasn't brash. And he seemed to operate with a moral compass. I'm hoping his new "Flip Side" column will inspire a few more of tomorrows young fly-fishers. I also hope it inspires you. The column will be a nostalgic mix of old fishing tales and stories of characters who helped shape our sport, along with Flip's commentary on the issues of the day. Who knows, Flip may even rock die boat on occasion. But diats OK -— rocking the boat is nor always a bad thing. Bill Bishop Jr., a tremendous tarpon fisherman himself, will illustrate the column, bringing Flip's words to life with his beautiful drawings and paintings. The new column replaces "Out There." But don't fret — Lou Tabory, Dan Blanton and Rusty Chinnis are not going tar. On the contrary, expect many more meaningful features and departments from these luminaries, beginning immediately in the November/December issue, which will include a Blanton feature on Delta stripers and a Chinnis piece on Florida redfish. As for Tabory, a little birdie told me he has some plans over the coming weeks, so we'll give the old salt a temporary pass in the next issue. After all, I'd hate to interrupt the bass master when he's shin-deep in the suds hunting a quality striper. Turquoise waters. Tropical breezes. Endless horizons. 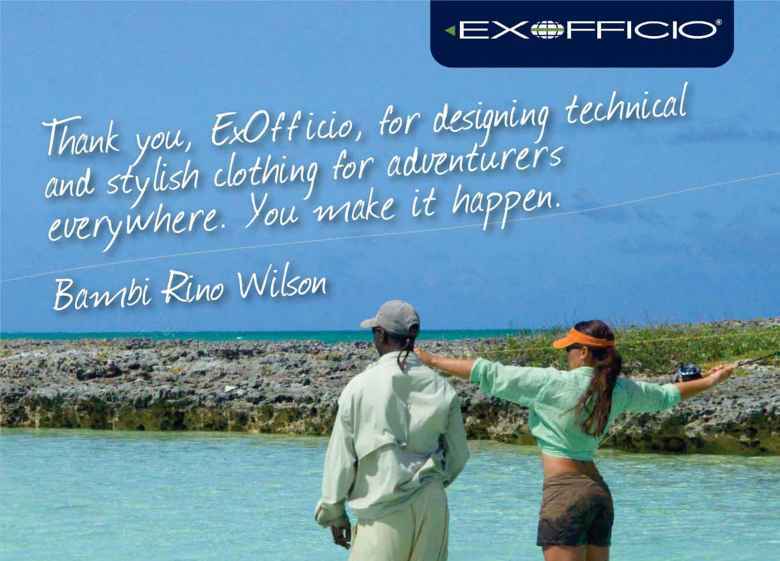 The experience of wetting a line in an unforgettable destination. And no one gets you there quite like the adventure travel experts of Frontiers. South Floridas Fly Fishing headquarters. Complete selection of tying materials. Tying and casting instruction by Certified FFF Master Instructor. From rhe beckcountry of rhe Gulf of Mexico to the blue waters of the Athmtic Occan you will find fishing grounds swirling with life. Tarpon, Bonefish, Permit, Redfish, Sailfish, and Dolphin can all be sought a few miles from the shores of Cheeca Lodge & Spa. 40612608. Canada returns tobe sent to Bleuchip IntL, P.O. Box 25S42, London, ON N6C 6B2. ne ot that long ago, flyfishing meant, for the most part, dry flies and trout streams. How times have changed. Today, the term "fly water" encompasses nearly everything from the tiniest, jump-across creeks to the wide-open ocean. Anglers now present flies from the surface into the darkest depths; bluegills, bass, trout (of course), salmon, steelhead, boneflsh, stripers, sailfish and bluefin tuna are all fair game. We've even heard of a guy chasing giant alligator gar on the fly. These days, any water is fly water. The perfect fly rod defined. r specific casting styles), the specialized long-distance-casting TCR series, and well, next thing you know, you're building 162 different rods. Our goal with each of these rods is to make it easier for anglers of all abilities, under any conditions, to put the fly closer to the fish. Of course, accomplishing this goal isn't easy. It means employing a dedicated (OK, fanatical) team of designers, engineers and materials specialists. It means investing an extraordinary amount of time in the lab and on the water. Our exclusive G5 Technology, which allows us to build the lightest, most responsive rod blanks in the industry, for example, took nearly five years of intensive R&D. And it also means a commitment to quality that can only be satisfied by handcrafting every Sage rod right here on Bainbridge Island, USA. OTOOB All right* imixd Printed In U.S.A. I really enjoyed your Editor's Letter, "All the Best," in the July/August issue regarding some of the great names in the sport, like Lefty, Mac Miller and Nelson Bryant. I also appreciated Ed Mitchell's excellent feature on Nelson. What a fun read. Thar full-page shot of Nelson in the surf reminded me of a Life magazine photo. I worked with Nelson on several stories in the 1980s and 1990s for his New York Times column. This was before e-mail, so we spoke over the phone — what a great voice, unmistakable and easily recognizable, like Curt Gowdy or Walter Cronkite! And behind it was a mind with a wealth of knowledge on fishing and beyond. I was sorry to read about the death of Christmas Island guide Polau Kaio in the July/August issue. My wife Terrie and I spent the last week of December 2007 on Christmas Island and had the good fortune of having Polau as our guide the first day. He was very patient with Terrie, a novice fly angler. We will miss Polau on our next trip to Christmas. In the July/August issue, Mark Hatter prompted anglers to explore the benefits of fly-fishing from a kayak in "A Kayak Craze." Like Hatter and his friends, my largest bonefish, redfish, bluefish and striper have all come from a kayak. Kayaks burn less fossil fuel, provide great exercise and are stealth machines on the flats. I also tend to learn the water better in a kayak versus speeding past in a boat. It helps me slow down, study the water and become more in tune with the environment I'm fishing. A great kayak brand Hatter did not mention is Tribal Kayaks. They come with easy-to-install outriggers and are the most stable kayaks I have ever experienced. 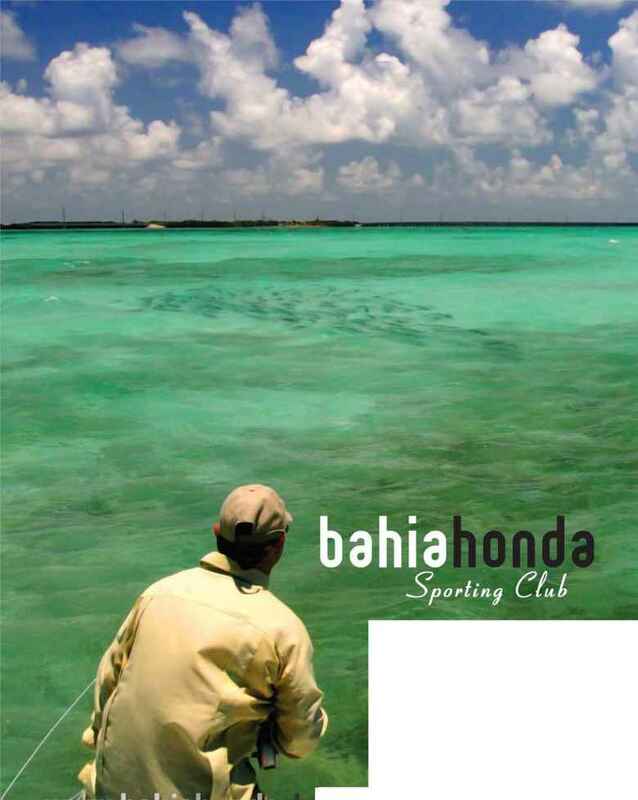 Thanks for providing a progressive saltwater fly-fishing magazine for our quiet sport. This past June, I fished with an old pal from Venezuela, Eduardo Aristiguieta, and our mutual friend, Luis Angel Rincon. Rincon owns Tropic King, a 46-foot Merritt operating out of Mango Marina in La Guaira. 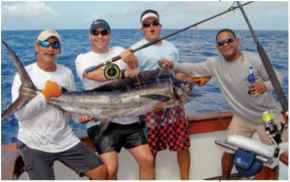 Together, these two men and their crew have been fly-fishing for white and blue marlin for years, and even though the blue marlin season was pretty much over, we gave it a shot since several fish in the 200- to 300-pound range had been raised recently. A spearfish unexpectedly crashed the teasers at 2:15 p.m., and 30 seconds later the battle was on. Ir lasted for about 20 minutes. Everyone on board was nervous to get the fish in, as it was the biggest spearfish the crew had ever seen. Yet we managed to bill the fish and then snapped a few quick photos before reviving it boat-side until it swam away. We caught the spearfish on 20-pound tippet and played released this beautiful spearfish in Venezuela. by the IGFA rules. It was a memorable day to say the least — especially watching that fish swim free to spawn again! That's a remarkable catch, Kristen. While keeping Atlantic longbill spearfish has been prohibited for some time by U.S.-flagged boats and citizens, only two fly-caught fish are listed in the IGFA's 2008 record book: a 56-pounder on 8-pound tippet and a 61 -pounder caught on 16-pound tippet. Your fish looks to have been every bit that large, if not bigger. Congratulations on a terrific release! — Ed. 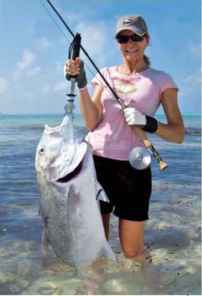 In the article "Striper Status" (July/ August 2008), Capt. John McMurray asks, "Where are the big fish?" I don't know about other states, but in Rhode Island during the second week of May, they were congregated in the upper Providence River, chasing pogies. But following the fish were 50 to 100 mostly commercial boats, along with 20 to 25 boats fishing at night. There were so many boats in the area that DEM had to monitor it every day for at least the first month. Rounding off the numbers, we had about 75 boats, 50 of which were commercial. Commercial fishermen are allowed five 35-inch bass per day. So assuming they caught their limit, they took 250 big bass per day — or 10,000 after 40 days. Hie remaining 25 so-called "sport fishermen" took approximately 100 bass per day (two anglers per boat, each with two 28-inch fish). That's 4,000 additional bass removed in 40 days. lhe year 2005 was a banner one for stripers in Rhode Island, but every year since has gone downhill. Thanks to all the killing of large female bass this year, 2009 can on ly go one way — and that's down again. Keep up the good work and the informative articles. Fly Fishing in Salt Waters is the finest fly-fishing magazine I have ever subscribed to. released this beautiful spearfish in Venezuela. Our most innovative technology yet, Sharkskin"' will revolutionize the way you experience fly fishing. Enjoy unsurpassed casting and accuracy, with reduced tangling, in any weather at any distance. 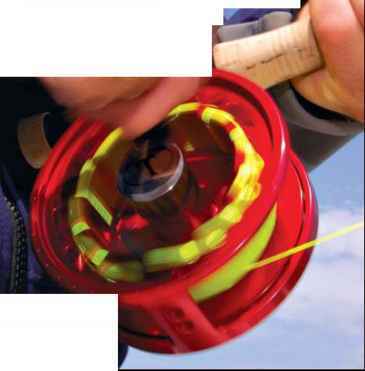 Visit our website to discover even more of the groundbreaking features in this fly line. 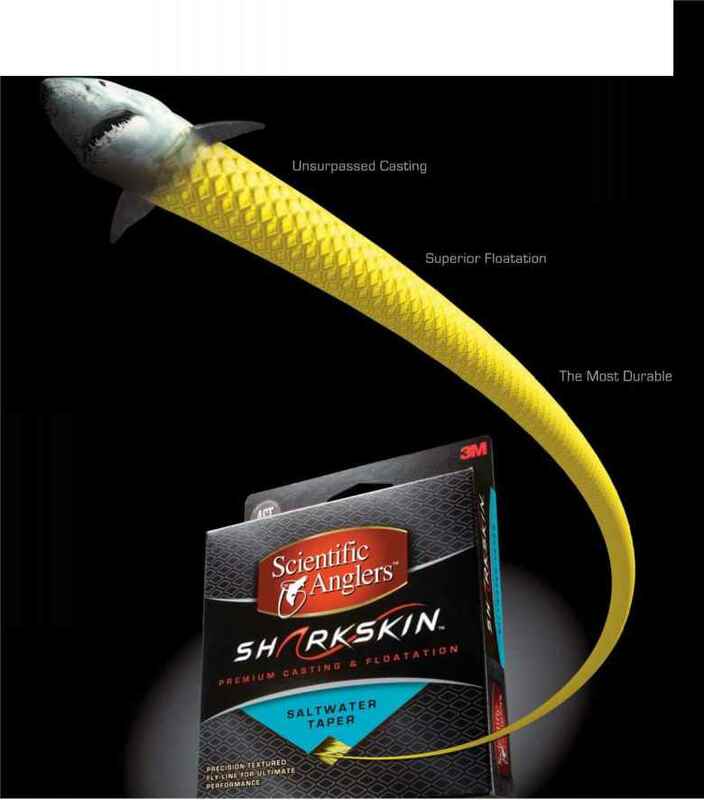 Scientific Anglers'" Sharkskin"' — inspired by nature, perfected by science. My Beginnings ts been a long time since I've felt like a newcomer, but at this moment, the shoe really fits. Although I've written now and again, I've never penned a regular column of my own. My credentials for writing this column are simply that, like you, I'm a fly-fisher. However, I'm a fly-fisher who was around at the beginning of the game and grew up in the stadium. That stadium was extreme south Florida and the Everglades in the 1950s and '60s. It was every inch my home. My grandfather arrived there in the last of the 1800s, and both my father and mother were horn there. So too were my wife and daughter — che perfect hurricane-fighting, "Cracker" family, you might call us. It was only by great good fortune and the calendar that my high school and college years corresponded witli the beginnings of serious saltwater fly-fishing. For me, it started something like this: My skiff was an air mattress. I inflated it one day along the edge of the road beside Ev Fowler's (later Papa Joe's) on Lower Matecumbe in the Keys. Within 100 yards, there were bonefish as big as Volkswagens. I learned about them from Henry Holden, one of the very early Bis-cayne Bay guides. 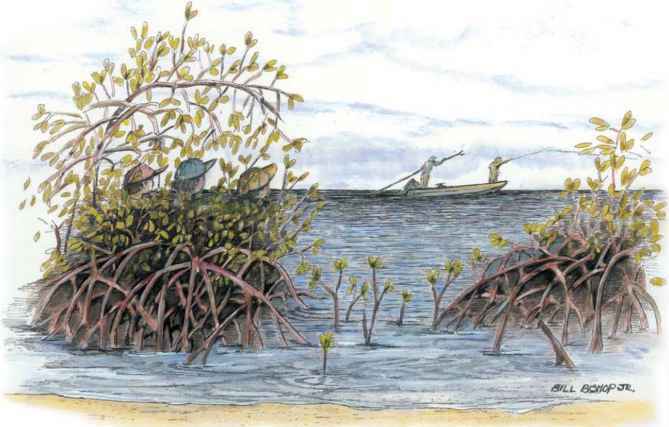 My friends and I often hid in the mangroves and watched him fish his customers in Norris Cut, then a very good bonefish spor. As I paddled my air mattress toward Shell Key from Fowlers, I figured I had a pretty good handle on this bonefish thing. I carried a small, wooden tackle box filled with Hamson bucktail jigs, my first glass spinning rod and a Luxor 2-R reel loaded with 8-pound-test line. The anchor for the air mattress was a rock and a length of parachute shroud. The colors of the water in downtown Isiamorada were straight from a Crayola box and blinding through plastic, nonpolarized glasses. On the near horizon and hard against Ashby Island, there was a skiff I recognized that belonged to Ceorge Hommet, an Isiamorada guide and my very serious hero. On the bow of the skiff was an older fellow, dressed in starched Willis & Geiger khakis and lace-up Topsiders. This guy was actually casting a fly to a school of tailing bonefish! I knew he was fly-fishing because I'd seen pictures of sports fly-fishing for salmon and trout. But never had I seen anything like this before. All at once, rhe long, five-sided bamboo rod was deeply bent, and a bonefish launched itself across the shallow bank in my direction, the song of a Hardy Zenith clicker-drag reel keeping perfect time with the fish's run! The hook was firmly set, not only in that bonefish, but in my formative brain: I would be a fly-fisher! The journey began that very day. Of course, there were no fly-casting instructors back then, and no seminars, no DVDs, tapes or illustrated books. There were no how-to articles in fly-fishing publications, either. In lact, there were no fly-fishing publications! In my youngerhood I learned along with my three great friends: Norman Duncan (the Duncan Loop), John Emery (the Emery Reel) and Chico Fernandez (author/fly innovator). The seldom-traveled street in front of Norman's house and the parking lot at the University of Miami (where we all went to school at night) served as our casting arenas. Norman's garage was our rod-building area. We'd build fly rods, test them in the street and then go fish them — all in the same day. We each had our own air mattress. Mine was blue. Although we were accomplished anglers with plug and spinning tackle, we were still struggling with fly gear. 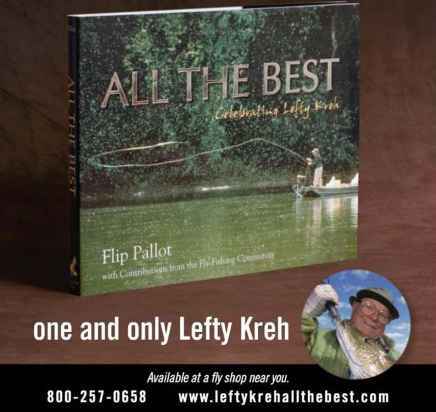 It wasn't until Lefty Kreh moved to Miami to run a local fishing tournament that we came to know what was actually possible with a fly rod. If you know Lefty, you know he was placed upon this earth for the sole purpose of dragging us, kicking and screaming, up through the depths of our casting inadequacies. He was then, as now, the consummate teacher, never displaying bur always sharing his knowledge. I drove him nuts — and I take this opportunity to apologize! Tlirough the rest of the journey, others shared their knowledge as well: Stu Apte, George Hommel, Jim Brewer, Don Prince, Ray Donnesburger, Eddie White-man, Dave Whitlock, Phil Gonzalez ... the list is too long to complete. In each case, these men asked nothing in return, simply expecting that I follow their example. I'm giving it a shot. When editor Mike Mazur asked me about writing this column, I was beyond flattered. When he asked what content I might be interested in, I wondered, out loud, what limitations might exist. His response: "Please try not to piss off advertisers too badly, Flip!" I'm going to give that a shot, as well, though I feel compelled to tell you what's in my heart and hope it calls to you. There will be very little "how-to" or tech talk. Plenty of that already can be found elsewhere in the magazine. I suppose there will be much more "what-if" associated with this column. I'd like to tell you some stories and perhaps introduce you to some folks and concepts that have guided my fly-fishing lifetime. The column will be illustrated by my friend and teacher. Bill Bishop. I know you'll enjoy his work as much as I always have, seeing his close connection to rhe natural world in every stroke of pen or brush. Finally, I'll try to provide a column that will cause you to see your own hand against a splintered piling as you push away from the dock. All Tibor reels are: Maintenance free • Warranteed for life • Made in the U.S.A.
Find out more at a dealer near you or visit tiborreel.com. Another innovation on the fly from Tibor Reel Corporation. Increase the speed of your retrieve to 33% with the new Tibor SpeedHandle " Spool. Use the standard handle for power, long runs or deep dives. Switch to the SpeedHandle when fish turn and charge. Clockwise from left: In just their second year fishing the grand-slam tarpon tournaments in the Florida Keys, Capt. Scott Collins (left, blue shirt) led David Dalu to victories at the Gold Cup, the Don Hawley Invitational and the Golden Fly Invitational. The feat had never been done before. year). Mill has claimed 11 grand slam titles overall, including five Gold Cups. Eizo Marahashi won five Hawleys and three Gold Cups from 1994 to 1999. Glenn Flutie won five consecutive Gold Cups from '92 to '96 before captaining Tom Siska to victory last year. Capt. Rick Murphy, meanwhile, has led multiple anglers to victory in every tarpon tournament as well. Dalu and Collins had fished together since 2002 but hadn't given the tournament scene a try until last year. They found immediate success, however, claiming most releases in the Golden Fly and victory at the Hawley, where they were the first rookie team to win in 33 years. The team has unquestionably made an impact in a short time span — and Dalu is making a name for himself. apt. 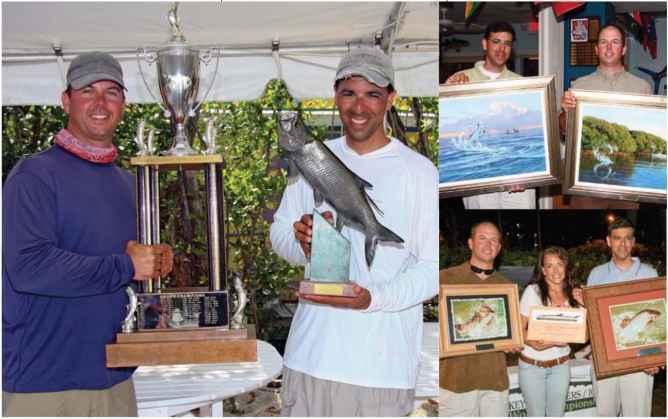 Scort Collins and David Dalu took the tarpon tournament scene by storm this past summer in the Florida Keys, becoming the first team in history to win the coveted Triple Crown. Their conquest began in late May, when Dalu and Collins recorded eight releases and three weight fish to win the Golden Fly Invitational. They followed that with a record-setting 21 tarpon releases at the Don Hawley Invitational and then chalked up three weight fish and 12 releases to capture the Gold Cup, simultaneously etching their names into the history book. "It was unbelievable," said Dalu, a 39-year-old emergency physician from Charleston, South Carolina. "The angler support was terrific. I don't know of any other sport where competitors actually pull for you. That's what sets fly-fishing apart." Said veteran Keys guide Mark Krowka: "It's never been done before, and it likely will not be done again." k ir iat really good fishermen, and he beat them three different times, so it's not a fluke." Dalu says that Collins was a huge catalyst to the team's success — what's more, the guides skill level was demonstrated again several weeks later in a July victory with angler Greg Smith at the prestigious Del Brown Permit Invitational. Dalu and Collins cited intense preparation and practice as keys to their success, and they were quick with praise for veterans of the sport as well. Specifically, Dalu cited Steve Huff, Billy Pate and especially Ray Fecher, whom he calls "the best tarpon fisherman in the Keys." Dalu also concedes that his accomplishments are "by no means in the ballpark of what guys like Andy Mill, Glenn Flutie and Eizo have done." Of course, only time will tell where the team of Dalu and Collins ultimately fits into the grand scheme of things. Jodie Johnson is poised to become the first angler in history to set 100 IGFA saltwater fly-rod world records. At press time, Johnson had amassed 99, with three new records pending. Johnson, who set her first record only four years ago, has since tallied records for 27 different species, most of which were taken on long-range trips to exotic locations, such as the Seychelles, Mozambique and Australia. Dr. Martin Arostegui, who has 185 IGFA records on fly, is also closing on the 100-mark in the saltwater arena. He currently has 93. 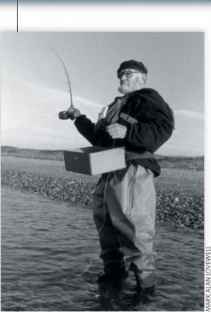 The late Gene DuVal is next on the all-time saltwater fly list with 58, while Dave Chermanski has 43. Legends Billy Pate and Stu Apte recorded 20 and 17, respectively, while another legend in the making, Diana Rudolph, has nine saltwater records on fly. weather, personal problems and other things like that, we'll know. After time, lots of it, they will truly be defined." Dalu says he and Collins hope to fish the Gold Cup indefinitely. More immediately, the duo plans to fish all three grand-slam events again next year. Stay tuned. 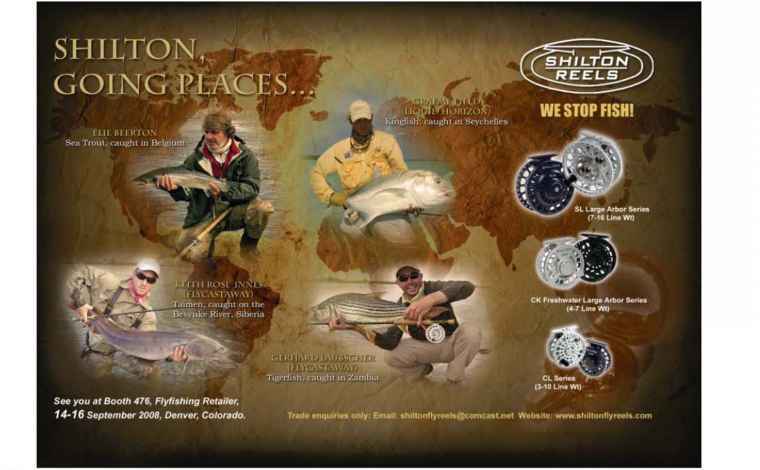 See you at Booth 476, Flyfishing Retailer, 14-16 September 2008, Denver, Colorado. What fish are in bill bishops grand slam ?